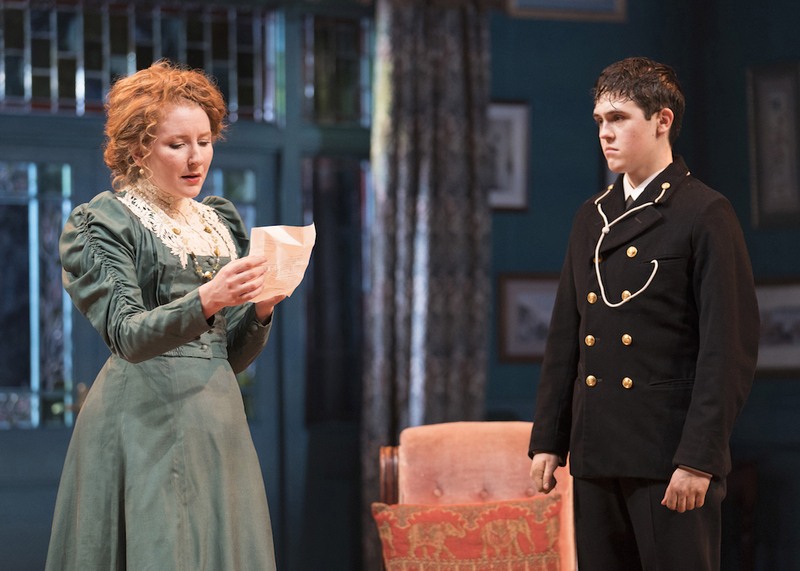 Terence Rattigan’s 1946 play The Winslow Boy is a fictionalised version of a true story. A thirteen young lad who was studying at the Osborne Naval College. Accused of stealing a five shilling postal order and expelled from school, his family refused to roll over and fought the case to restore his honour and that of the family name in the courts of law as well as the court of public opinion. Letters in the newspaper opined on the issue and front page headlines screamed out the latest developments. Parliament spent a day debating the trifle and some people wondered whether there weren’t more pressing issues (like the deteriorating political situation across Europe) that better deserved their attention. But what started out as being very personal become extremely political as one family took on the state and a military institution and demanded the right to a fair trial. 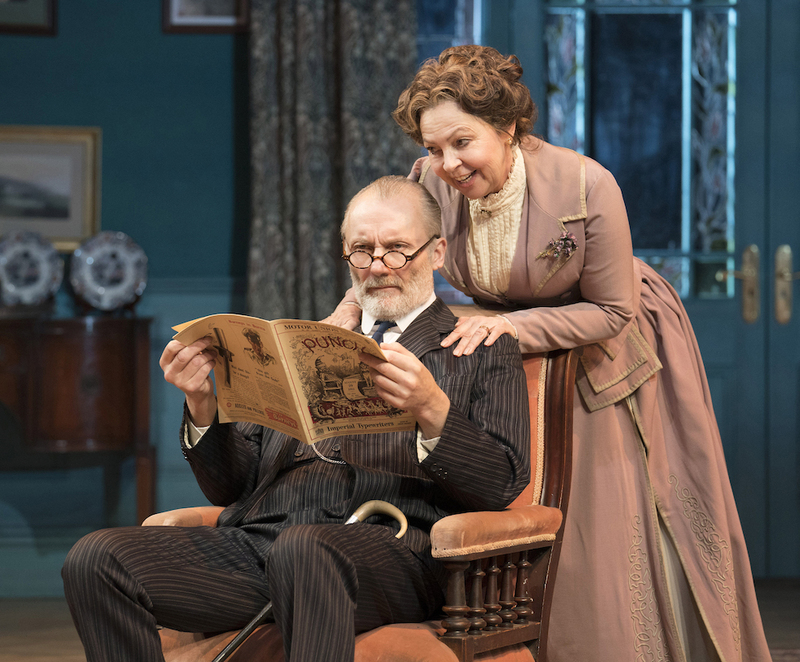 Birmingham Repertory Theatre’s revival of The Winslow Boy probably made sense to the producer with the suffragette movement centenary celebrations this year. 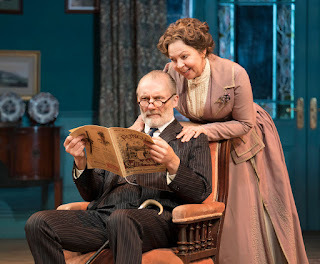 But touring the show to Belfast in the week that the Supreme Court are sitting less than a mile away from the Grand Opera House to hear a case about a cake (or rather the absence of a cake) with the Attorney General involved was a scheduling master-stroke. Misha Butler plays young Ronnie Winslow. Incredibly tall and clearly an example of height-blind casting, he plays the 13-15 year old at the centre of the story, a lad who is on the cusp of maturity and independence, but has neither fully let go of his childish ways nor learned to shun his mother’s hands-on care and attention. Much of the fuss goes over his head as people fight on his behalf but largely without his input. The irascible and cantankerous father Arthur Winslow is played by Aden Gillett (last on our small screens with a role in Jackie Chan’s memorable spoof Troubles film The Foreigner, available on Netflix). With each new act, Arthur’s arthritis visibly deteriorates while his spirit stays strong. Often seated in the middle of the stage, the play revolves around this stubborn man who risks his all and undermines his children’s happiness to fight injustice. Gillett’s balanced portrayal keeps the audience on his side long after we should have grown annoyed that Arthur is a bully with no sense of proportion. Mostly this is due to the humour found in his bombastic behaviour. Behind this failing brute of a man stands his wife Grace. It’s not the first time Tessa Peake-Jones has taken on the role of a character who has to adapt to her partner’s weaknesses to hold a family together, having played Raquel in Only Fools and Horses. 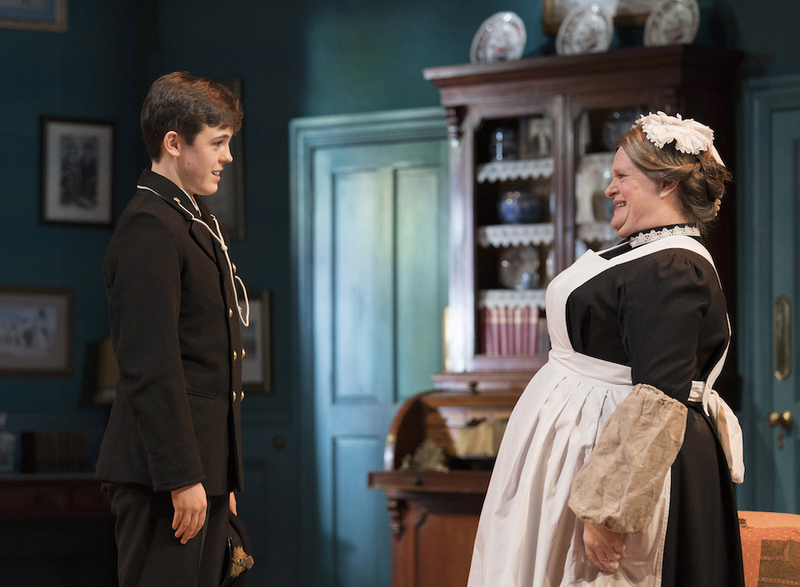 She manages the level of household hysteria, engineering a sense of calm and civility that is only broken when the wonderful Soo Drouet bursts onto the stage as untrained maid Violet and blurts out any secret that is being suppressed. The accusations levelled against Ronnie and the subsequent battle to clear his name bring suffering onto both of his siblings. Theo Bamber makes his professional stage debut as work-shy Dickie who enjoys a subsidised lifestyle pretending to study at Oxford. But it’s his sister Catherine who shines out among the cast. Dorothy Myer-Bennett encapsulates the tension between being seen as a feminist and a suffragette organiser while revelling in her love of thrifty fashion and her search for permanent companionship. 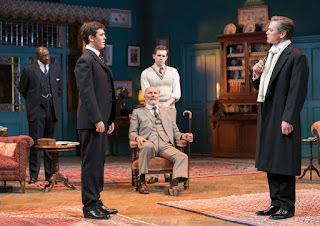 Her character alone sees the wider human rights picture and parries with every male in the play – two or three of whom are suitors – and always comes out on top. Opposition MP and prominent barrister Sir Robert Morton is engaged to fight the case. [William Crawley reminds me that the character is based on Sir Edward Carson – yes, that one – who was engaged to fight the Archer-Shee case.] His devastating cross examination of young Ronnie gives the audience plenty to talk about over the interval, and director Rachel Kavanaugh empowers actor Timothy Watson to milk the script for every last drop of ambiguity each time he encounters the strong-willed Catherine. Throw in a fiancé (William Belchambers), an amorous solicitor (Geff Francis) and a frivolous reporter (Sarah Lambie) and you have a classic drawing room play that manages to connect 1908 with 2018. The semi-transparent walls in Michael Taylor’s lurid greeny-blue one room set allow the audience to see characters approaching the doors back stage and give shape to the house the action is trapped inside. 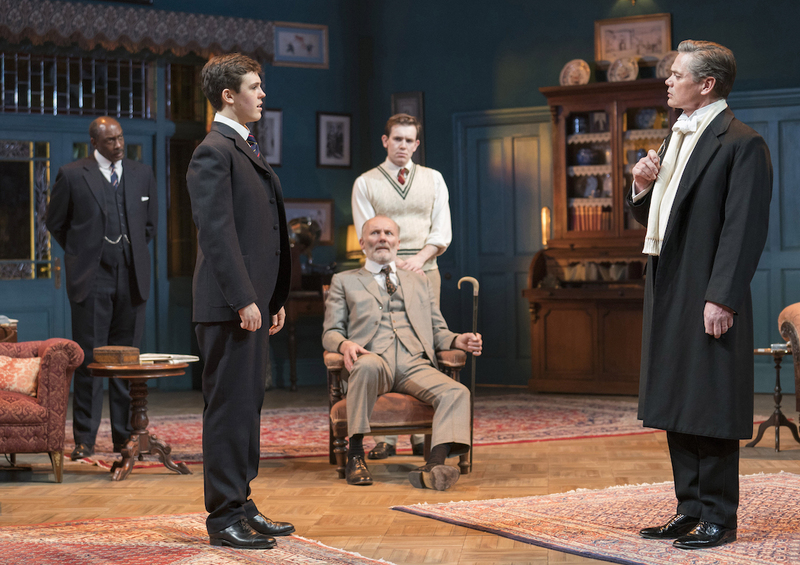 Playwright Rattigan plays fast and loose with the sense of time, stretching the four acts over a two year period but compressing the end of the court case into such a flash that the jury members’ bottoms would barely have been able to hit the seats in their jury room before they had to run back into court with their verdict. On paper it looks like a vanilla period drama. But there’s a saltiness to the script that resonates in 2018 where issues of proportion, the “despotism of Whitehall” and the tabloid press are all still under scrutiny in a world that cries out “let right be done” but argues over whose rights are most important. 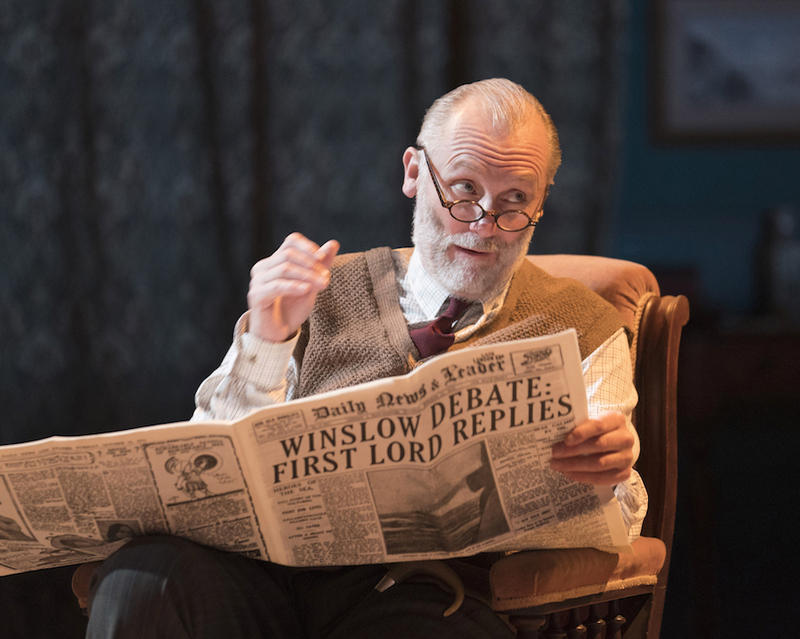 The Winslow Boy continues its run in the Grand Opera House until Saturday 5 May.